This award acknowledges that S.M.A.R.T has developed a leading workplace which maximises the full potential of its workforce through practices that demonstrate effective employee recruitment, engagement and retention. Founder and Group Operations Director Jim Vais said the award reflected the importance S.M.A.R.T placed on its people. “From our inception we knew we needed to invest in people if we were to be successful. We are continually investing in the training and development of our team members and we provide a career structure for everyone and that makes us unique in the industry”. 71 per cent of current leadership roles in S.M.A.R.T have been filled by internal appointments and S.M.A.R.T is developing a fast track competency based on training new entrants to the trade, and is currently working with 23 apprentices. “By ensuring that every team member has the skills and knowledge to perform well, we enable them to deliver the best customer service, which keeps our customers coming back”, Mr Vais said. GM Human Resources, Shelley Holst, said S.M.A.R.T’s inclusive culture had been important to winning the award as Employer of Choice. “We encourage team members to show they care about their team mates, to play as a team as people can achieve more by working together, and to have courage to try something new and suggest improvements. We also ask our people to try and inspire others and to coach and help members of their team.” The ABA award is the fourth to be won by S.M.A.R.T, with previous awards for Service Excellence in 2014, Innovation in the Industry in 2013, and Environmental Sustainability in 2012. 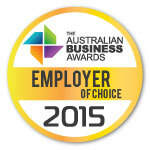 For more information on the Award visit Australian Business Awards.